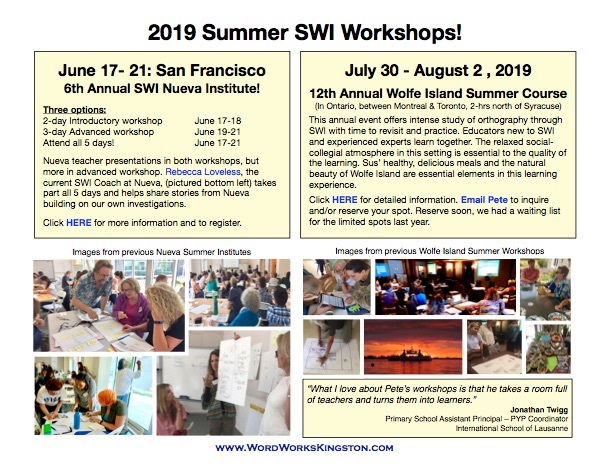 Click HERE for this Newsletter sparked by a blog post by a pre-school teacher at the Nueva School that provides such a rich account of early SWI instruction. I add multiple stories of instruction of the interrelation of morphology, phonology and etymology in the early grades at Nueva and many other schools. I also address the research supporting this practice and invite researches who remain skeptical of this instruction to come and study with us! Click HERE for an inspiring story from a tutor that illustrates the fact that far from inhibiting the learning of grapheme-phoneme correspondences, studying these conventions within the context of morphology is a necessary condition for making sense of how grapheme-phoneme correspondences work. Click here for a document with resources to help your teachers and students get started! Click here to see videos Dan Allen posted on his blog of my lessons with students in Grade 1 - 5 classrooms and with teachers during my visit to the Zurich International School. Click here for a document with background on each video and related resources. To help you get started with my teacher resource book, see the first video in which I teach from the first lessons. The screen shot at right is from my visit with Dan’s students! I have posted a pdf at this link on Real Spellers with a revised <sign> lesson after learning that what I had presented as an <-ify> suffix can be analyzed further. That pdf shares the evidence that convinced me to make this change. I also use this learning experience to share a key feature about matrices and word sums. Books printed after May 2013 already include the revised lesson. 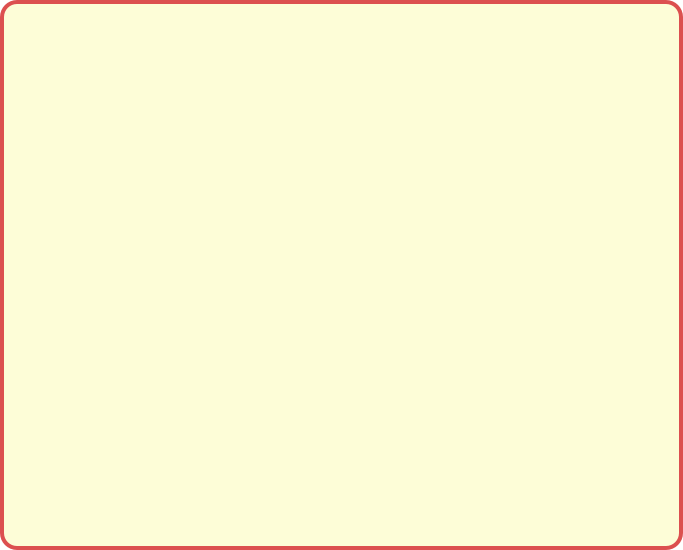 You know you have the revised version if you see on <ify> suffix on the <sign> lesson on page 8. Even if you have the revised version, I recommend you download this pdf to gain from the explanation that helped me understand why this revision was needed. “Word Scientists” look for the deepest word structures that make sense of the greatest number of words. Click HERE for background on SWI. Making sense of how words work by investigating morphology, etymology and phonology. enduring understandings of how the written word works. "This article by Pete Bowers makes some interesting connections between UbD, Real Spelling and the development of critical thinking skills in students." Click here for information on spelling-out word sums including a free pdf guide for teachers who want to use this process for learning, instruction and assessment. Click here for a video of an on-line Skype session addressing this topic with Grade 2 teachers and an article addressing how this topic links to the UbD. June 24-25: Fort Vermilion School Division (north of Edmonton) 2-day teacher workshop. Pete is presenting a Keynote Address at the main annual literacy conference in Australia. Other presenters on SWI topics include: Lyn Anderson & Ann Whiting (Caught in the Spell of Words) Fiona Hamilton (WordTorque) and Julie Shepherd. July 30 - Aug 2: 12th Annual Wolfe Island Summer Course! The course is filling up with amazing folks. Click HERE for information. Keynote at 12th Annual Literacy Institute Confernece hosted by HKIS. See this document on possible models, including hosting classroom-embedded workshops. Also see this WW Newsletter for more on this topic. Note: If you see that I am giving a workshop at a location near you, feel free to contact me to see if I can add a visit to your school on the same trip. I also do on-line workshops & model lessons via video conference all the time. Click HERE to go to a new blog by my brother Jeff Bowers, a cognitive scientist from the University of Bristol. We have written a number of recent articles related to SWI. You can find that work in this blog (and at the bottom of my About WordWorks page). More importantly, Jeff does a great job of explaining the context of this research in his blog posts. I highly recommend exploring this page often, and adding your comments to the discussion! Click here for the inaugural post for the new SWI based blog “Caught in the Spell of Words” by the new team of long-time orthographic experts Lyn Anderson and Ann Whiting. This is a brilliant post for both teachers new to SWI wondering about how to get started and teachers with much experience with SWI looking to refine their orthographic understanding and instructional practice. Glorious. Click here for a video of Nueva pre-school teacher Carolee Fucigna as they create a morphological web on the base <rain>. See how straight froward it is to investigate morphological families with readers and non-readers. Click here for a post from Rebecca Loveless on “Word Bag Excitement” that offers teachers a sense of this excellent activity for studying word families modeled on Lyn Anderson’s work. This is a great reference for jumping in. Rebecca’s site has many more posts to explore too. Click here for Mary Beth Steven’s brilliant recent post “Outer Beauty Attracts, but Inner Beauty Captivates.” This is a wonderful way to compare studying real “word families” compared to words that simply rhyme. Explore her whole blog! Click here for an inspiring post, “Comprehending Spelling” from Sue Hegland’s excellent blog, “Learning About Spelling”. This is a short, accessible and eloquent case for why we should do the obvious -- teach our written word works. Click here for a “User’s Guide” for working with this computer tool including links to tutorial films, complementary resources and links to related research. Watch this video to see how teachers and students can easily create matrices from word sums on Mac or PC computers with Neil Ramsden’s “Mini Matrix Maker”. Explore Lyn Anderson’s excellent blog with illustrations and resources about structured word inquiry for all ages at this link . Lyn has been developing her understanding and practice in this area for over a decade. Her lessons and ideas for morphological instruction from the start are just exceptional. See the video above for a short video with Pete discussing SWI at the Nueva School. Spelling it like it is! Click HERE for a pdf of the document below with links to more information. 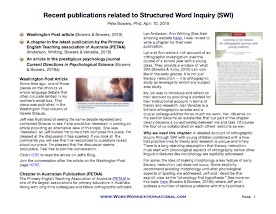 Click HERE for the document (at right) with information and links about these three recent publications related SWI and the research.